We can now boast of knowing so much more of Pluto and its moons than we ever have before. New findings, published in the journal Science, provide additional information about the planet system, including the surfaces and rotation of the satellites involved. The video shows the unusual nature of the small moons of Pluto: they behave like spinning tops instead of keeping one side directed towards Pluto (shown at the centre). Find the five moons, Charon, Styx, Nix, Kerberos, Hydra starting from the innermost orbit to the outermost one (the latter four are the small moons). Pluto is no more as far away from us as it used to be in terms of what we know of it. The New Horizons mission has resulted in an extensive amount of information gleaned on the dwarf planet. Ever since the New Horizons spacecraft approached its surface, Pluto has slowly been revealing its secrets to us. A recent paper builds up on this body of information. This latest finding focuses on Pluto’s moons, the 4 smaller ones, namely Styx, Nix, Kerberos, and Hydra. It was previously thought that these moons might be similar to its largest moon, Charon which forms a binary planet with Pluto; it was speculated that all five were formed at roughly the same time. However, as points out Mark Showalter, senior scientist at the SETI Institute, the surfaces of the 4 moons are much brighter than Charon’s, and they also appear to be much older. Another surprising detail about the dwarf planet and its minions is the unusual rotational features of the latter: they orbit at high speed around tilted axes (see in above video). The spins of the moons were expected to have been re-positioned by now as the gravitational tides from Pluto were thought to have slowed down. But, this has not happened. What triggers this strange rotation? New Horizon scientists think outside objects colliding might be the cause. The new observations also include characteristics of the atmosphere of Pluto. David Hinson, another senior scientist from the SETI Institute, explains that they found several layers of bluish haze over the surface of the dwarf planet and reaching heights of around 200 km. Also, the temperature of the upper atmosphere (at 11 microbars) is lower than was initially thought. Yet another observation shows that the temperature of the lower atmosphere differs from one location to another. Charon has also revealed its secrets. The surface of the satellite, known to be icy, is specially red at its northern tip. This colouration is thought to be the result of tholin, a molecule whose formation is stimulated by ultraviolet irradiation of methane and ethane. Ammonia ice has also been found on Charon. 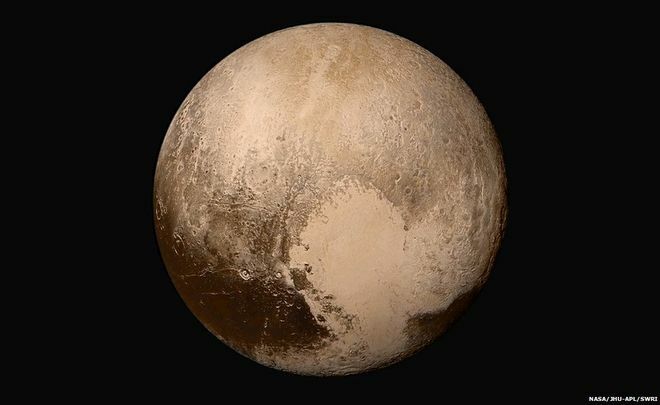 Furthermore, the scientists deduced that Pluto’s largest moon is not as geologically active itself.